"Migrant Workers must feel very lucky that they get to work in Singapore"
"Migrant Workers will be very rich when they return to their own countries"
Do you find yourself often hearing these? Are you unsure of whether or not these are true? Find out for yourself at our workshops! 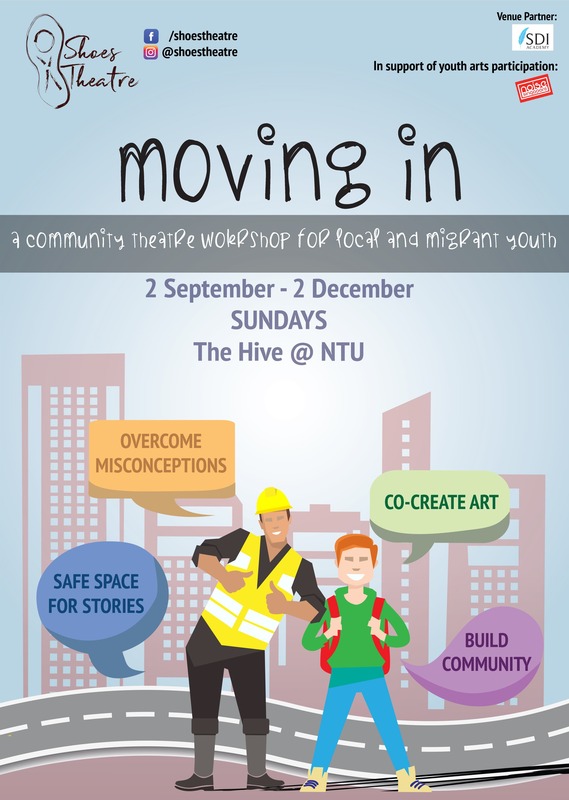 Shoes Theatre is proud to present Moving In - a series of drama workshops aimed bringing together young Singaporeans and young low-income migrant workers to create art. By engaging in drama games and activities, the participants will explore similar and differing worldviews and life circumstances. This project aims to dispel misconceptions that one group might have about the other, and most importantly, to create opportunities to integrate migrant workers into the Singapore society. If you're a Singaporean or low-income migrant worker between the ages of 21 and 30, we'd LOVE to have you join the programme as a participant. This workshop is FREE for all participants. Snacks and refreshment provided every session. Contact us to register your interest or find out more! This project is presented in partnership with SDI Academy. This project is supported by Noise Singapore, an initiative of the National Arts Council that encourages young people in Singapore to express, develop and showcase their creativity.